Jones served in various training roles during his time at UTSA. 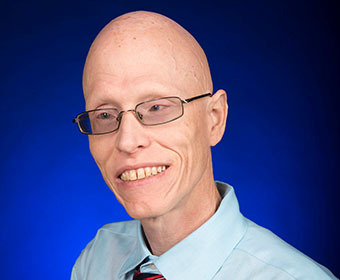 (Jan. 9, 2019) -- Bradley Jones, training coordinator in the UTSA Office of Financial Affairs, passed away last week at the age of 48. Jones joined Financial Affairs in July 2017, and previously worked in the UTSA Office of Instructional Technology (OIT) as a training specialist and an instructional development specialist. Jones received a Bachelor of Arts in Interdisciplinary Studies and a minor in Geography from UTSA in 1995. He earned a Master of Education in Curriculum and Instruction from Houston Baptist University. Jones first joined UTSA in 2008 and trained faculty, staff and students on Microsoft programs as an OIT staff member. He was promoted in 2012 to oversee the development of curriculum and assessment tools for diverse projects and training. Jones’ career focused on education through technology, including at the middle school and high school levels. He served as a mentor to new middle school teachers and to UTSA graduate students in training and instructional technologies. Jeanette Francovich, enrollment services associate, enrolled in several classes that he taught during his time at OIT. Jones was a fiscal year 18 third quarter BRAVO Award recipient for his work with the web team to create a new Financial Affairs training website. He was elected by his OIT peers to serve on the UTSA Staff Council as a representative under the vice president for Academic Affairs from September 2009 to August 2011. He was an active member of Oak Hills Church, having served as a greeting ministry coordinator. He also volunteered with the San Antonio Conservation Society as a booth chair for A Night in Old San Antonio. Jones leaves behind his girlfriend of five years, Jennifer Roosa; his sister Delisa Jones Reynolds, two nephews and one niece. A Celebration of Life service will be held Saturday, Jan. 12 at 12:30 p.m. at Oak Hills Church Crownridge Campus at 19595 W. Interstate 10 in the west auditorium.